Let the games begin! 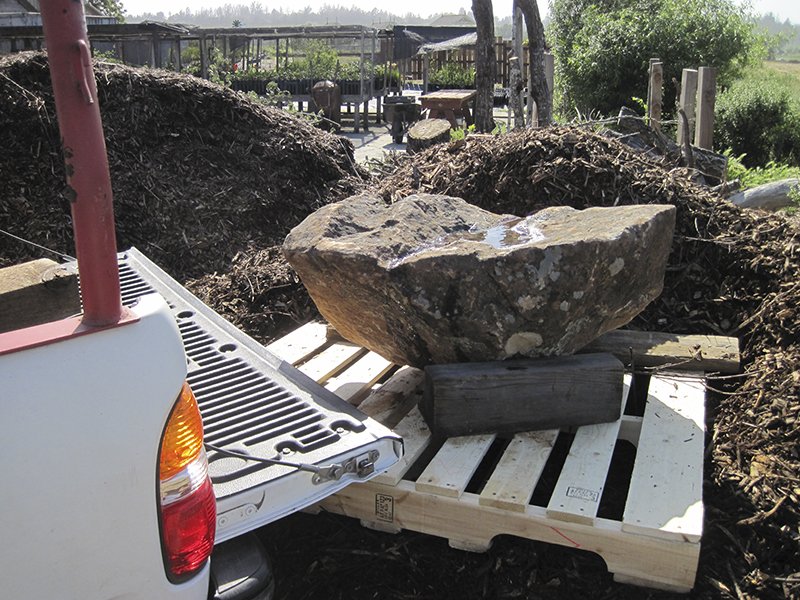 And the players for last month’s workshop (July 12th) at the Laguna Environmental Center are a 600 pound Sonoma fieldstone boulder (left) and an oak rootball with stump (right). Both the boulder and the rootball will become the main feature of their own wildlife habitat installation. Stuart Schroeder of Stone Farm helped me (Tony McGuigan) place both the boulder and the rootball near the proposed habitat sites — nice to have a tractor do some of the work! 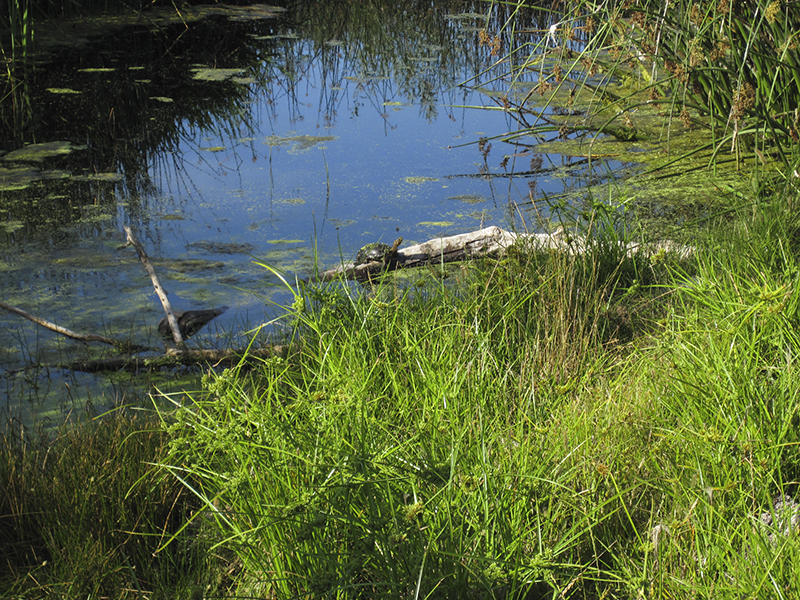 A western pond turtle keeps a wary eye from Turtle Pond Float. 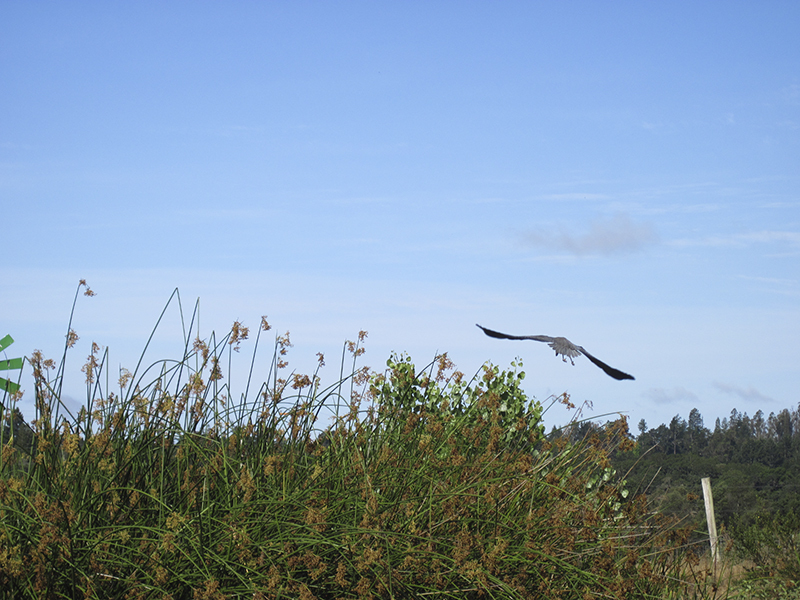 then flies over the pond. 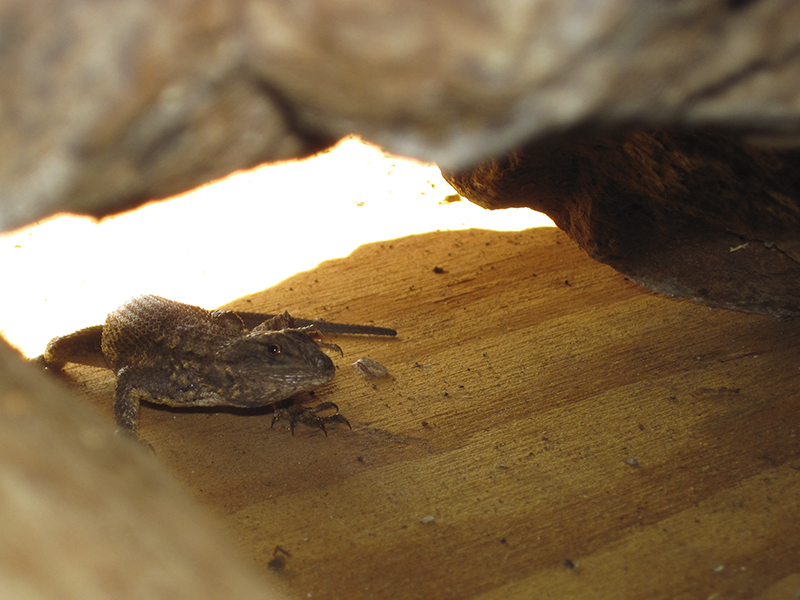 A Western Fence Lizard peeks from under the Sonoma fieldstone boulder we will soon move. Tools at the ready. From left: pruners, digging bars, roofing tile puller, shovels, soil chisels, hoes. And some of the materials we will be working with. 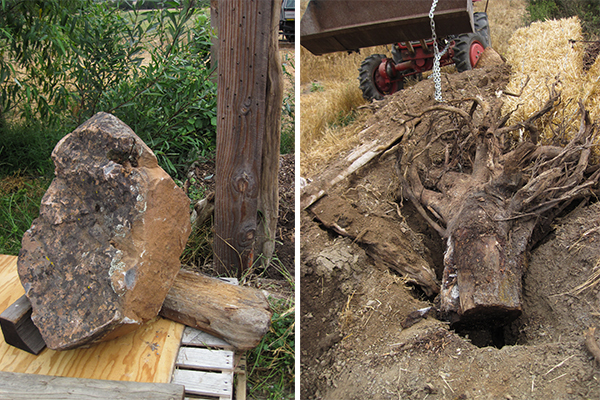 Valley oak trees, deer tree tubes, Sonoma fieldstone boulders with water-holding cavities, driftwood, and wood stumps. The workshop started with a discussion in Heron Hall regarding wildlife habitats for residential settings. Pastry, coffee, and tea make planning the day so much more fun! On hand for the habitat landscaping was one Laguna Foundation intern, two Laguna Foundation Guides, four participants, and me, a Laguna Foundation Docent, as instructor. 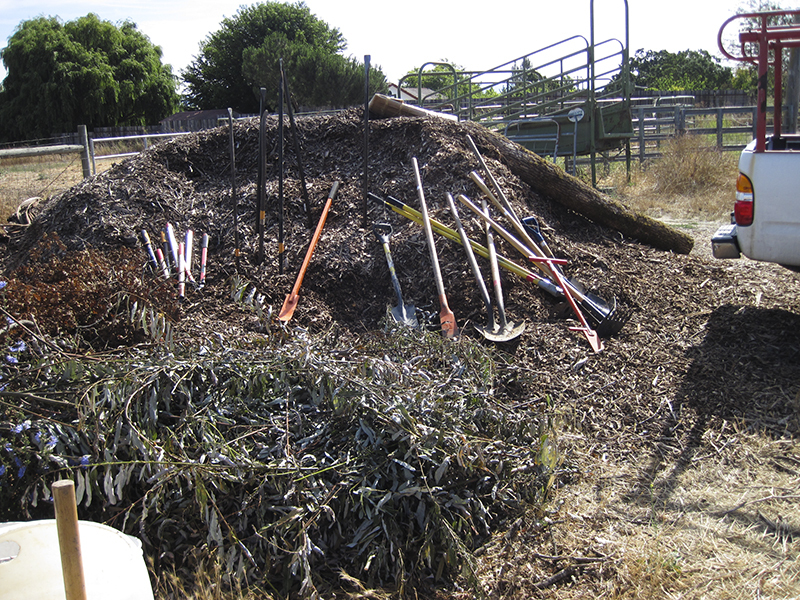 Behind the Foundation’s Nursery is a compost area, which itself is a rich animal habitat, as is any thriving compost. The Nursery manager recently asked all working at the Nursery to hang up the garden hose when finished; she wants to prevent contamination of the water left in the hose. The hose has been hung up, sometimes here, sometimes there. 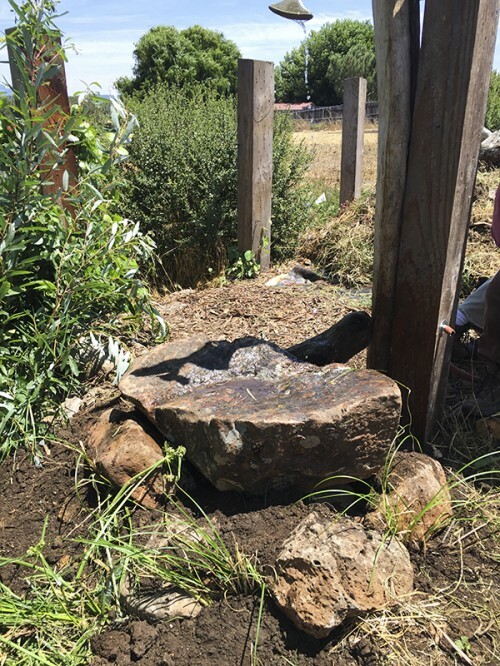 “Big Splash” wildlife habitat installation is about getting the hose hung up in mostly one place — the dripping water from the hose will provide water to the critters living under and around the large water-catching landscape boulders. The Before. 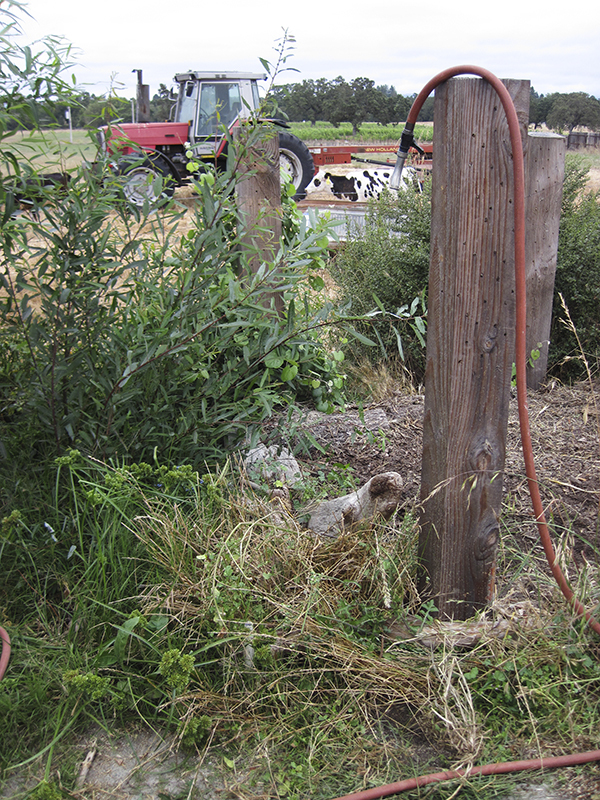 Big Splash will be directly under the hose hanging from Compost Cricket Corral’s southwest post. Moooo! Note the nutsedge (Cyperus esculentus L.), front left; it will be saved because of its native status. The surrounding weeds (non-native plants) will be removed to allow native plants to thrive around the habitat. 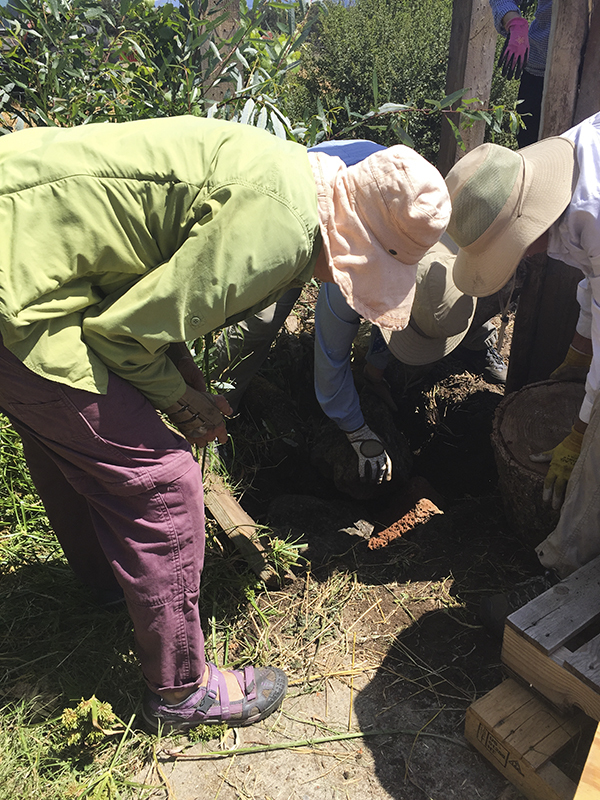 A hole is dug alongside the compost post. 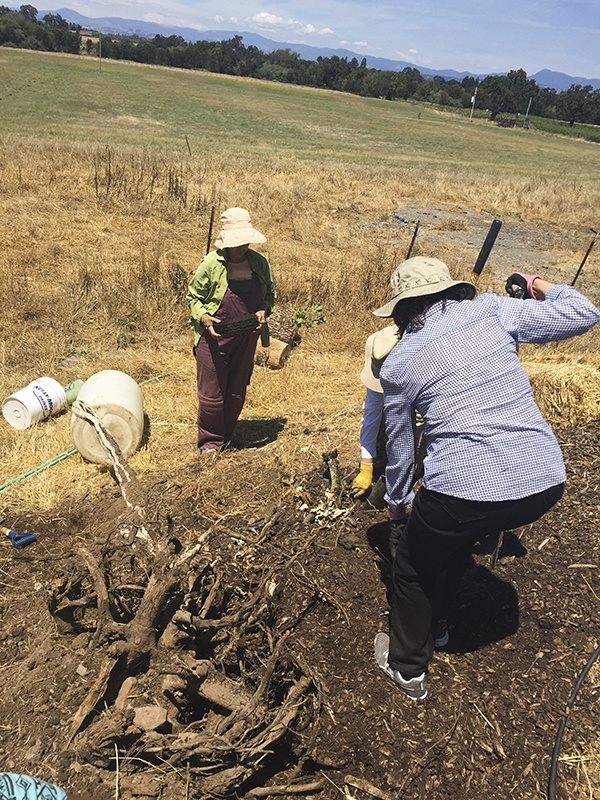 The soil is set aside in buckets for later use — this rich topsoil will be used to establish new Santa Barbara sedge and field sedge plants surrounding Big Splash. The large V-shaped boulder on its side (left) is blocked (to prevent movement) on a pallet next to the hole. Melon (cantaloupe and honey dew)-sized fieldstone rocks are carefully positioned in the hole to maximize their water-holding surfaces. Some rocks have one or two thimble-sized cavities; other rocks present a smear of small holes that will hold water. 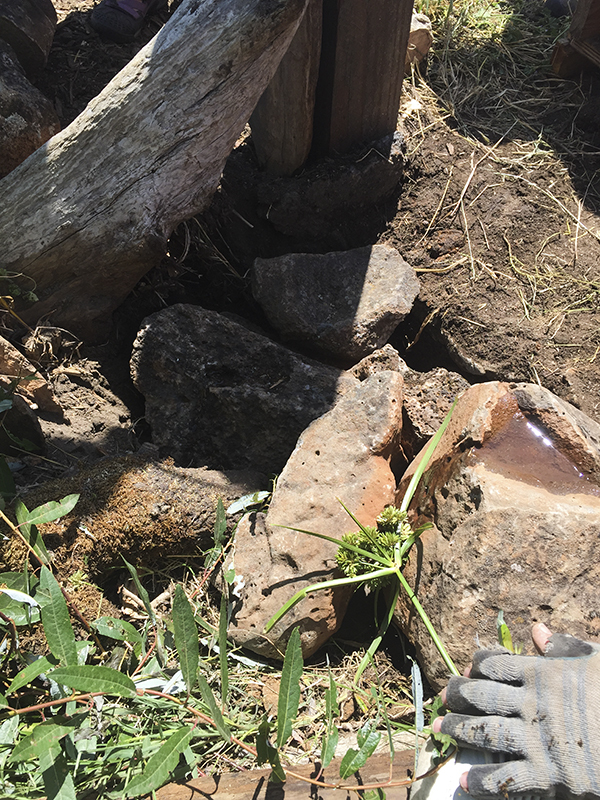 The rocks, in total, will provide moist cavities for critters to gather water from. Other animals will prey upon those seeking the water. A habitat is born! 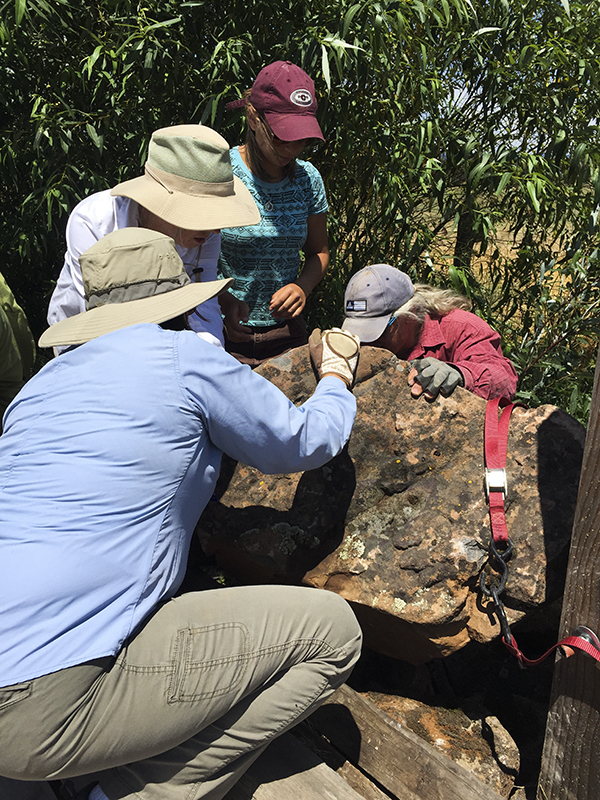 Using water to determine a rock’s most-water-holding position. The rock will be placed on the lower rocks so that the “lake” is most full. A foundation of water-holding fieldstone awaits the large V-shaped fieldstone boulder, which will sit on top. The view is from inside the compost, looking toward the Nursery’s concrete slab. The large boulder is leveled to test its best water-holding position. St. Mary’s River flows out of Lake Superior — think very small critter! Lots of push and pull to get the 600 hundred pound boulder “level” so that it will hold water. 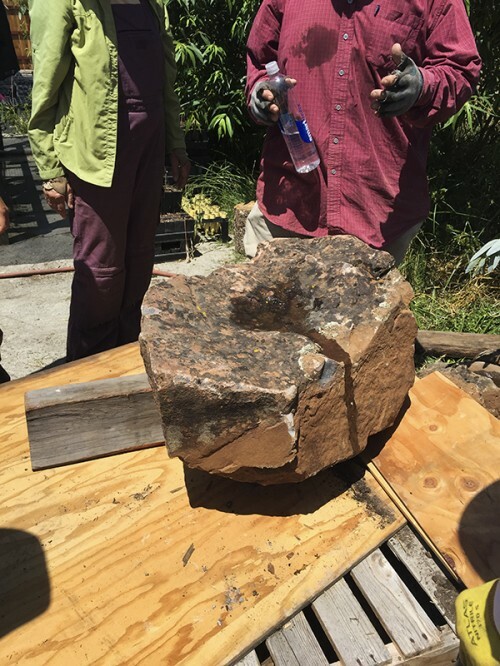 And take a breath — the fieldstone boulder is in place. 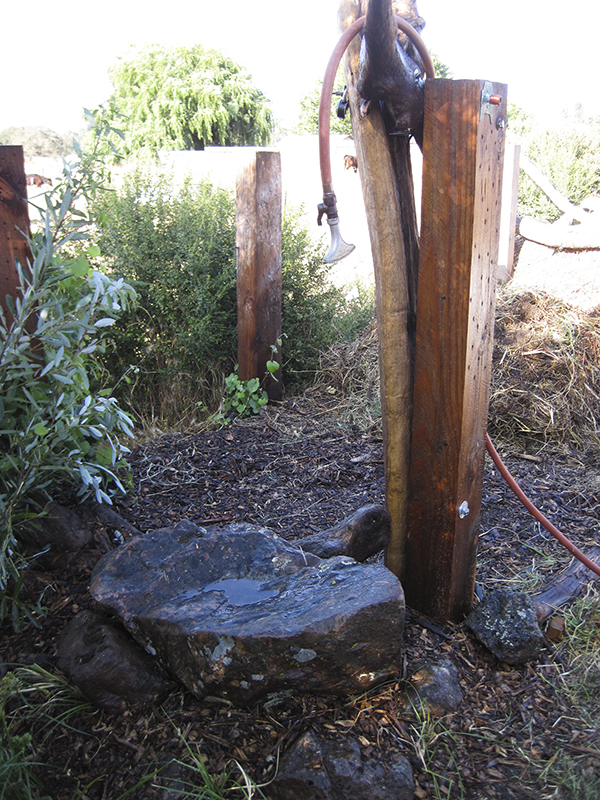 The top boulder is placed to receive the hose drip. Once Boulder Lake (think like a microbe or tiny birdbath critter) is filled, the moistness/wetness/water will drip down the side of the large fieldstone boulder to smaller, also water-holding, rocks. There are about a dozen such rocks under Boulder Lake. Soil, plants, mosses, lichens, and critters will call this pyramid of cavities, nutrition, and water “Home”. In other words, 3 of 4 ingredients of habitat have been met: shelter, food, and water. Because some critters will stay local to, if not live in, the moist pile of rocks, those critters will reproduce near or in the habitat installation. Number 4 ingredient, “a place to raise young”, has been met. Santa Barbara sedge (Carex barbarae) and field sedge (Carex praegegracillus) are planted among the rocks. Woodchip mulch is added to suppress weeds and give moisture to the establishing sedges. 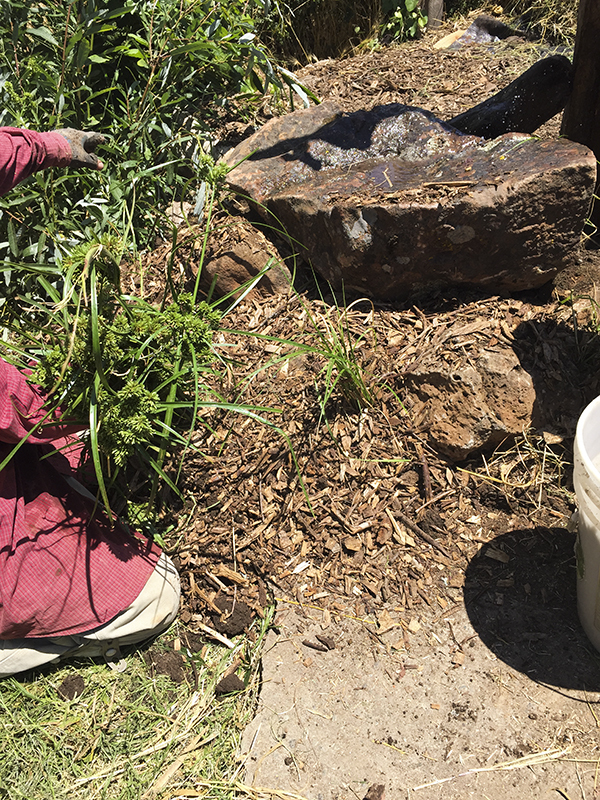 The woodchip mulch will break down, leaving rich organic material, enriching the new sedge planting. 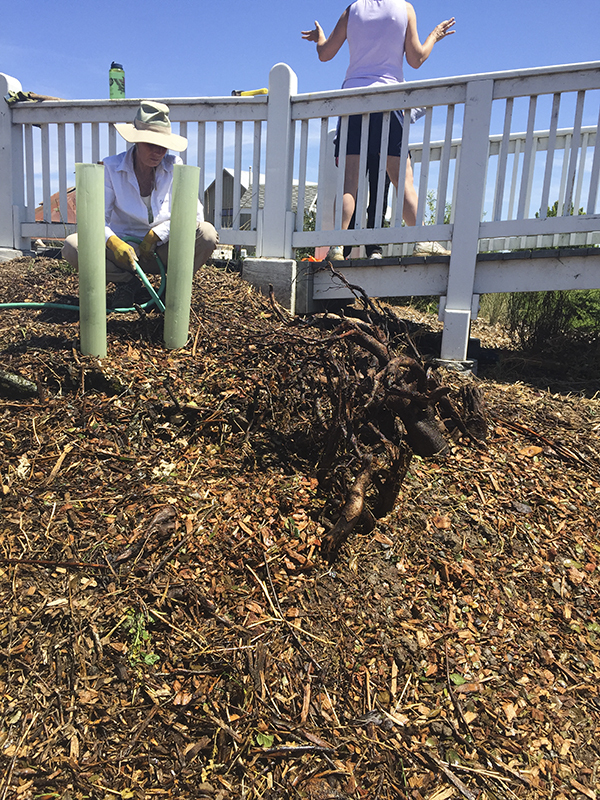 Soon a white net of mycorrhizae will spread throughout the decomposing woodchips, thereby benefitting the sedges. The hose is temporarily positioned using driftwood; we are looking for the hose position that will target the hose drip into the center of the boulder to create Boulder Lake. A good watering to jumpstart Big Splash Hotel and Spa wildlife habitat. Soon the sedge plants will surround and shelter the base of the large boulder, providing food and shelter to small critters. Larger animals will return to the watering hole. Big Splash Hotel and Spa is finished. One habitat down, one to go for the workshop session. Site where rootball was harvested. The rootball is nearly camouflaged; look between the digging bars. 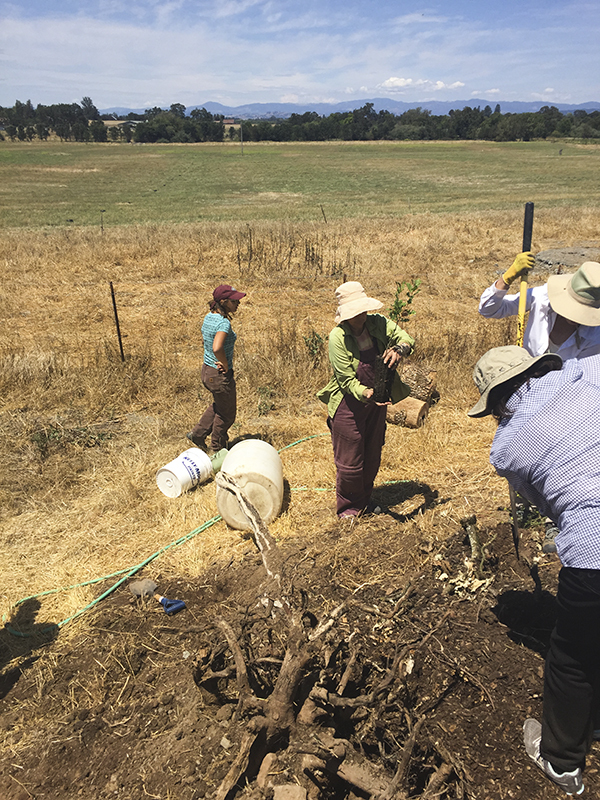 The oak tree rootball, that is destined to become the focal point of a wildlife habitat installation, is covered in adobe soil, adding to its very heavy weight. 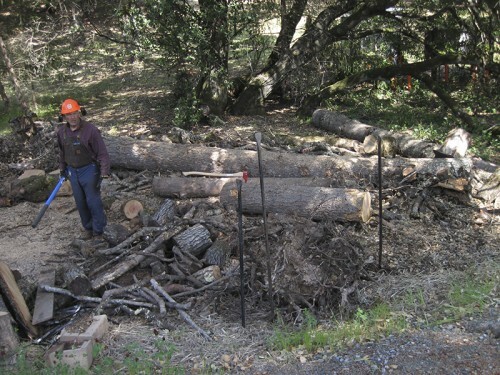 This logger’s garbage is a treasure to us habitat landscapers. For him, the soil between the roots would ruin the chainsaw blade. But as a habitat feature, the soil will diversify the habitat’s materials. Most excess soil will be removed from the rootball just to get it in the back of the truck. Oak Rootball arrives at the Laguna Foundation in April 2015. Because the project slated for the rootball is three months away, a corral of logs was made around the rootball. 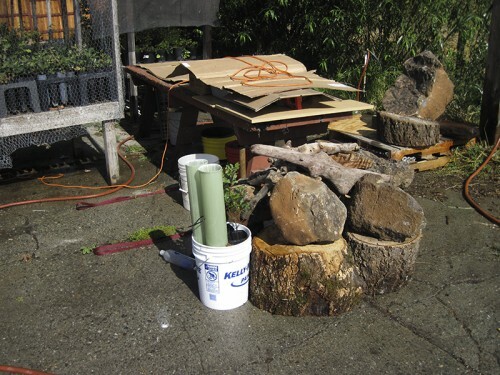 The logs will help hold the tall mound of woodchips about to cover it. 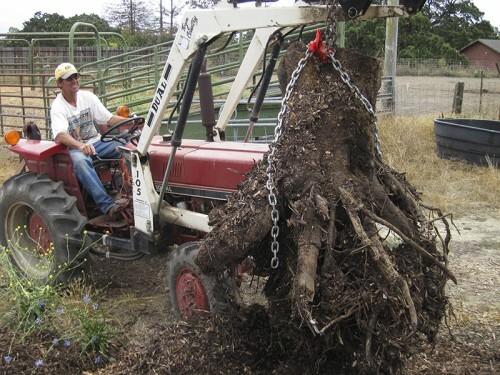 The rootball will sit in moist woodchips for three months before being installed in a wildlife habitat. Since the rough plan is to bury the rootball in a new habitat (3 months from now), it will also be buried now — any Life in the soil-impregnated rootball will be welcome in the new habitat. The dead rootball will be delivered to the habitat ALIVE! 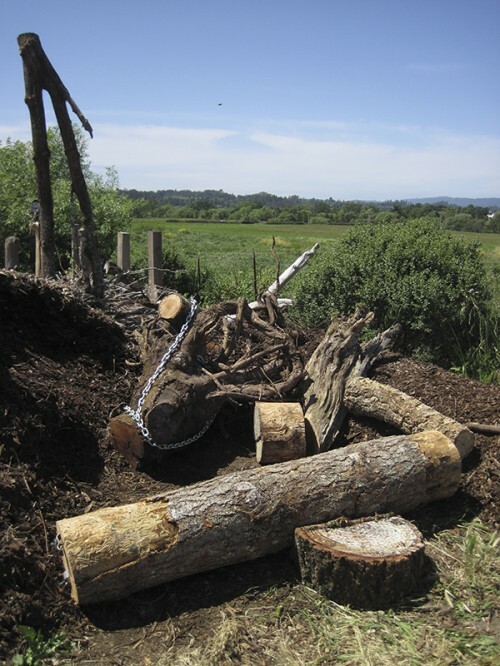 A log is attached to the chain tether. The rootball is nearly buried in woodchips. 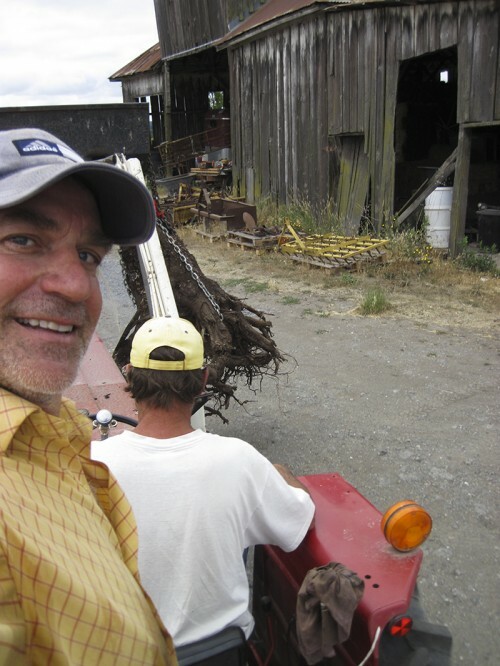 Come July, in three months, Stuart’s tractor will haul out the stump by the chain — sure beats digging out the rootball! The Before. The Laguna Foundation’s Observation Platform ramp rises from a small hill above the cow pasture (left) and straw field (foreground). 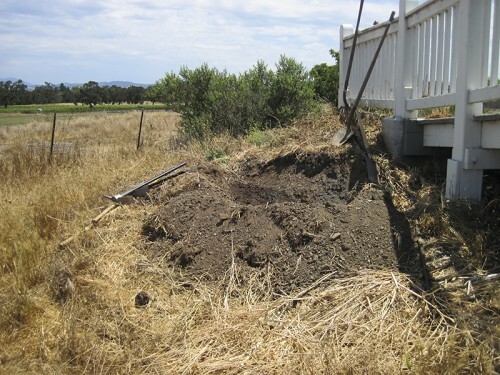 We will take advantage of the small hill’s slope to dig in the rootball, but we must be careful not to undermine the ramp’s supports built into the hill. The habitat’s valley oak (Quercus lobata) seedlings will be planted to allow tractor travel along the fence. Also, the trees will be planted a safe distance from the ramp to not encroach upon it. Digging goes easier than expected. Actually it’s a problem — the earth is a mix of gravel and soil fill from the pond grading. We move the hole for the rootball further downslope to avoid undermining the ramp’s concrete supports. 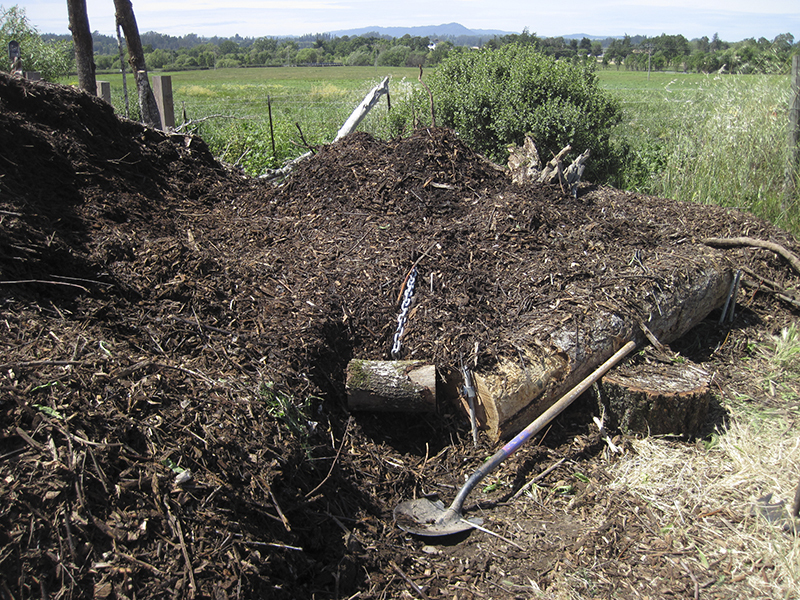 Time for the rootball — up and out of the woodchip pile it comes. And I get to ride. 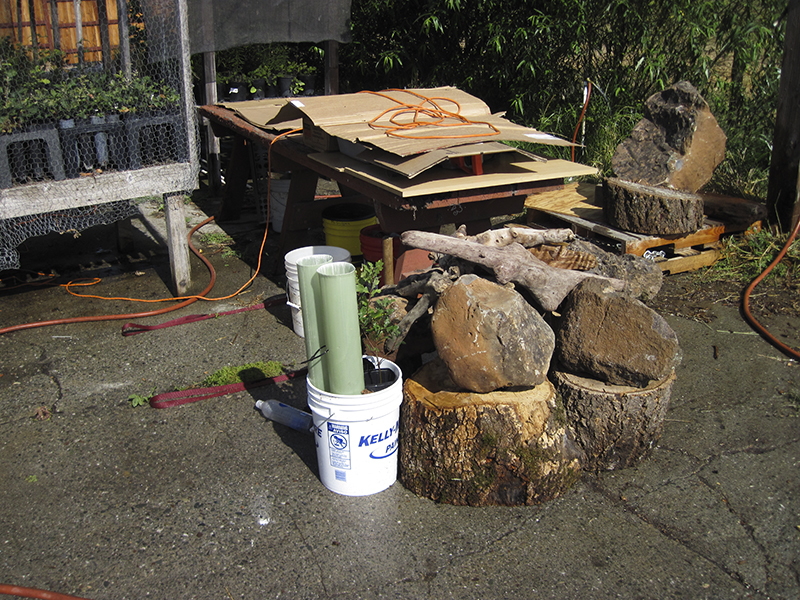 The plan is to lay the rootball downhill to simulate a fallen tree. The milled (man-made cut) at the crown will be buried to help create a natural look. 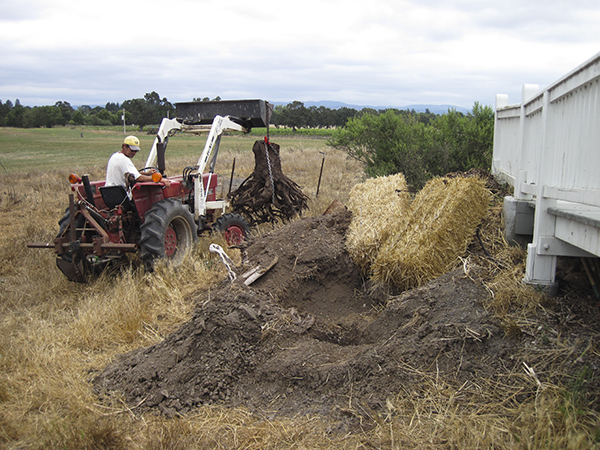 Note the straw bales; they were used to keep the loose slope from eroding the few days the hole was exposed before the workshop. In goes the rootball. 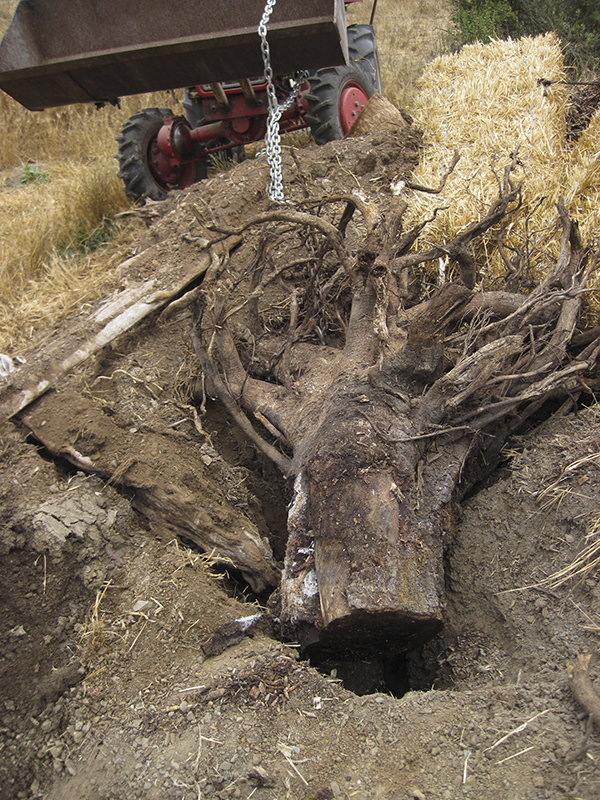 Note how the roots extend above the surrounding ground and that the stump cut is down in the hole. 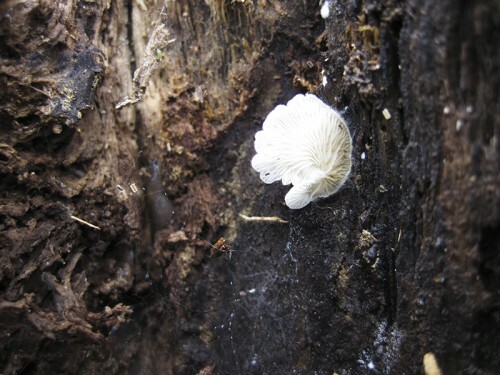 Also note the white patches on the rootball/stump crown — fungi was thriving on the rootball while it was buried in the woodchips. Close-up of fungi growing on the oak rootball. The rootball is tipped to lower the stump end below the level of the surrounding soil. The rootball and other wood hulks are positioned half in, half out of the hole. Fill, fill, fill. Because so much wood is in the hole, there will be extra soil to mound above the hole, on top of the wood. 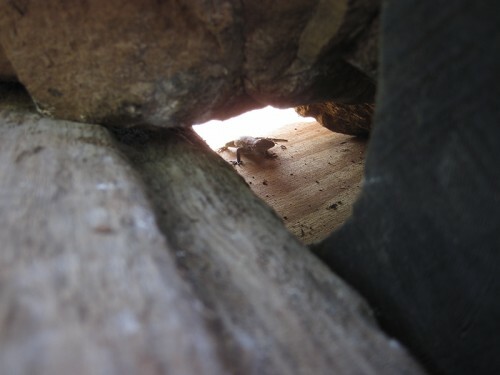 A critter perch is laid in the hole to the right of the rootball. 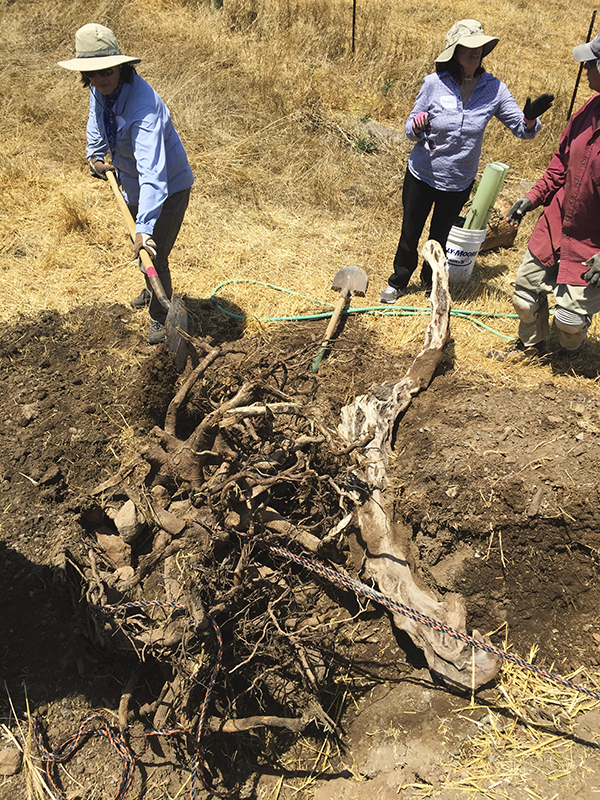 It will be mostly buried so that only a 4-foot length sticks out of the hill when the habitat is finished. Other wood chunks are thrown into the hole to provide more cavities for wood-loving critters AND to displace soil. By filling the hole with other than original soil, we will be able to mound the soil higher, or perhaps make a berm of soil where there had not been one. In go small oak branches and twigs, broken up by stepping on them. We want to create moisture retention and fungi spawning for the valley oak seedlings. 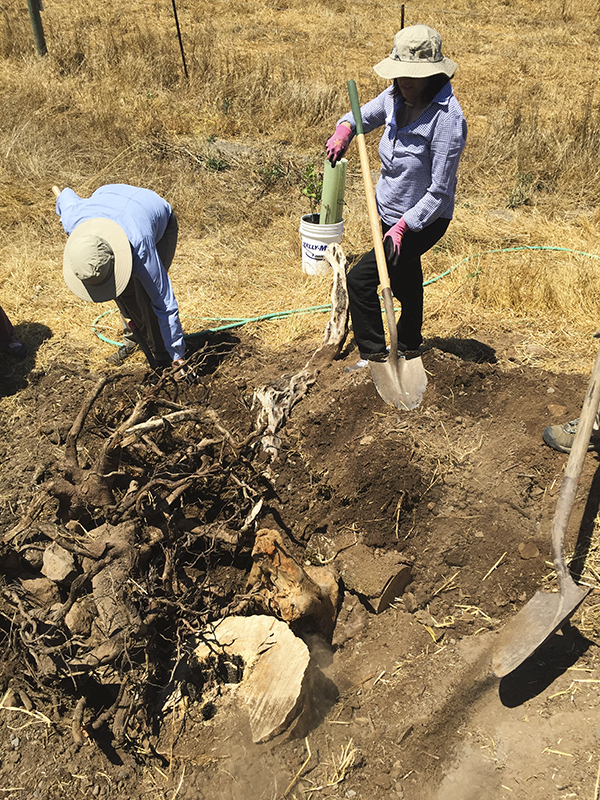 Layers of organic matter (oak rootball/oak branches/oak woodchip mulch) will attempt to humbly simulate oak tree savanah soil, which is layered by decades, if not centuries, of decaying oak wood. Topsoil from the hole, which was set aside in large bins, is used to fill over the poorer quality soil and the oak branches. 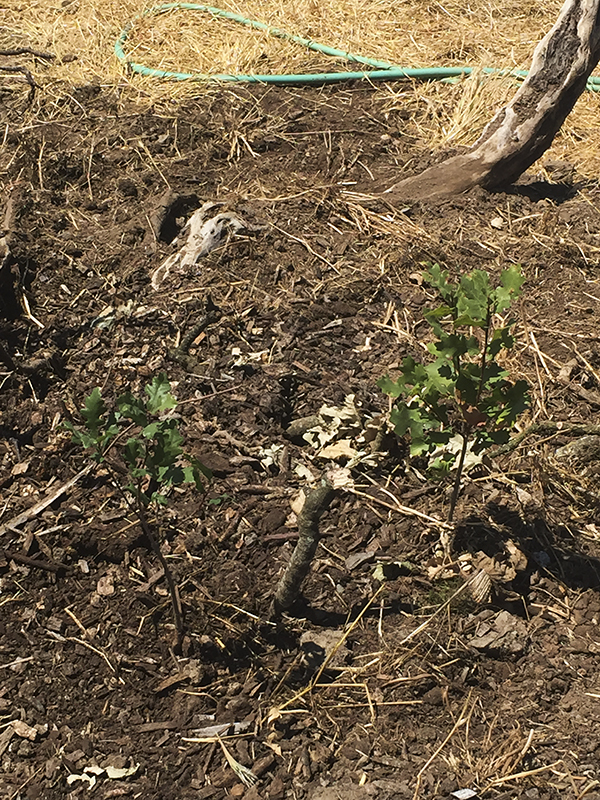 Here comes the first valley oak seedling. 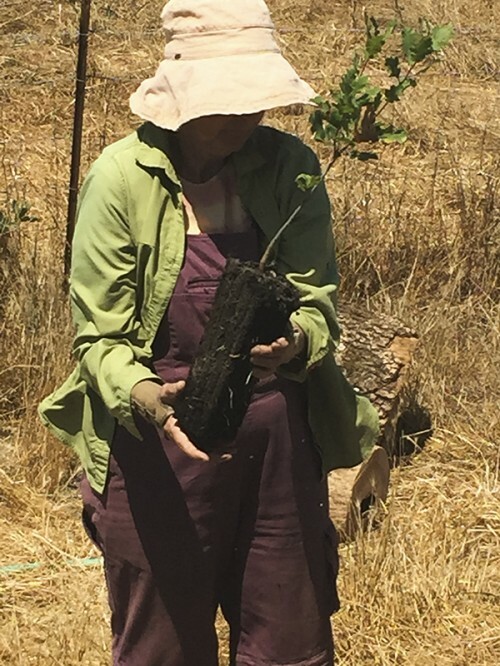 Today I plant a mighty oak tree. Valley Oak (Quercus lobata) may live up to 600 years old. The Observation Platform might need a paint job by then! and covered with plastic tubes that will allow light in but keep deer from eating the young trees. Oak woodchip mulch is spread around the trees. 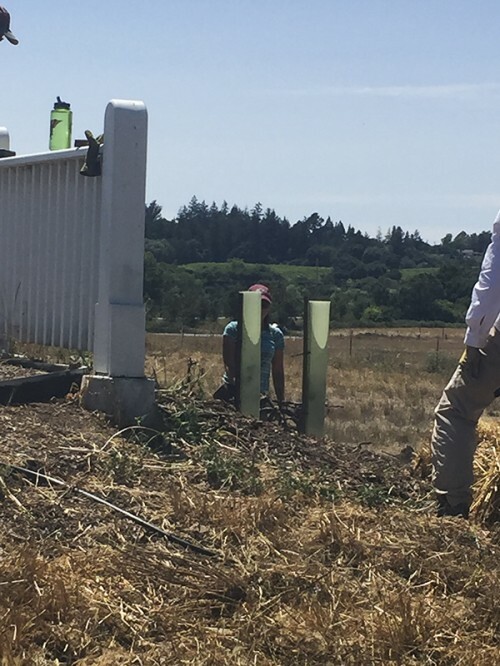 The trees are watered as a final step to the completed wildlife habitat installation. 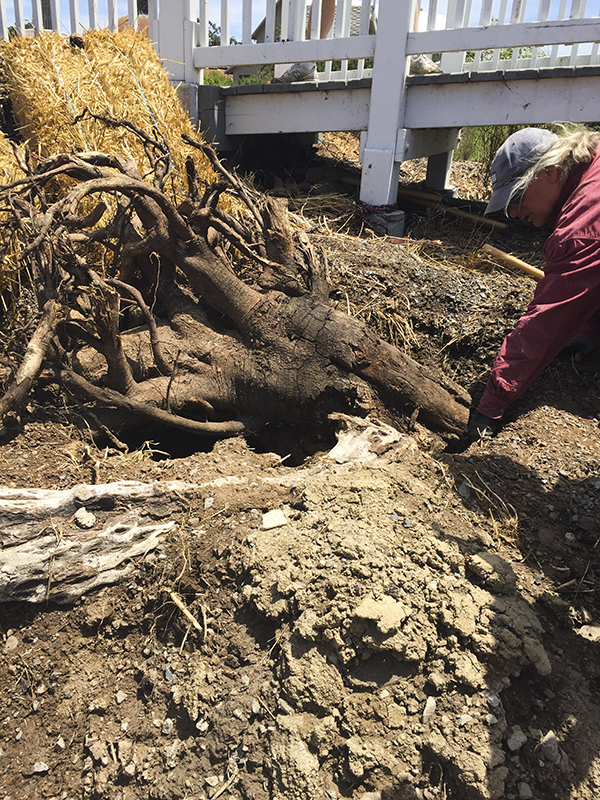 Note the Medusa-like tangle of roots emerging from the ground. What is going on there? What critters will seek habitat there? Questions, questions. Keep asking! The workshop was a success. 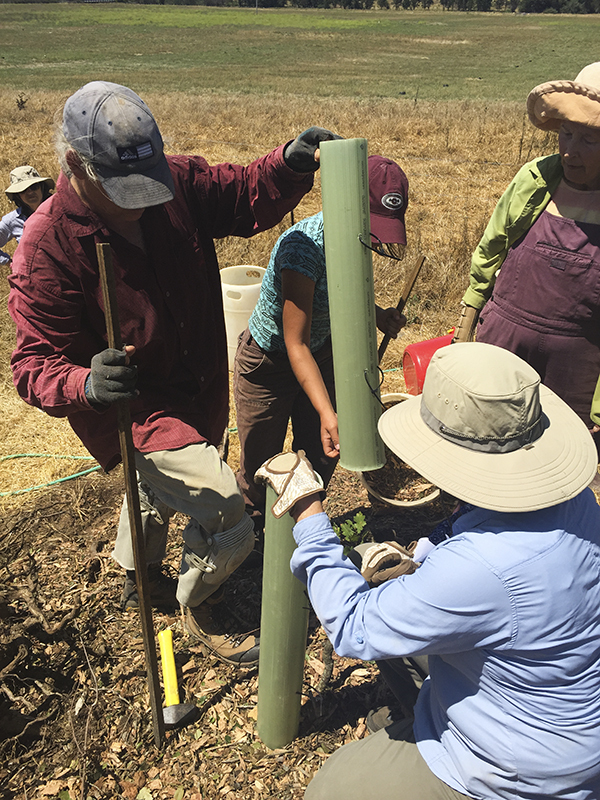 Thank you to the LF Guides, Marcia and Barbara, the workshop participants, and intern Sasha — we installed 2 wildlife habitats and nobody got hurt. Thank you’s to the Laguna Foundation staff for your support of my work at the LEC. In particular, to Wendy Trowbridge and Brent Reed of the Conservation and Restoration Department and to Anita Smith, Public Education Coordinator, for her work in promoting my July 11th presentation and this workshop. A big thank you to Tractor Man — Stuart Schroeder. Enjoy your wildlife habitat creations. Habitat it! 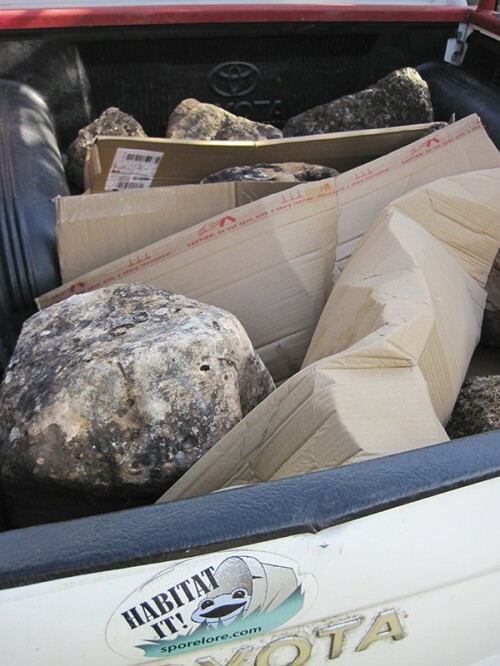 Getting ready for this Sunday’s workshop — Tony’s truck bed load of fieldstone. 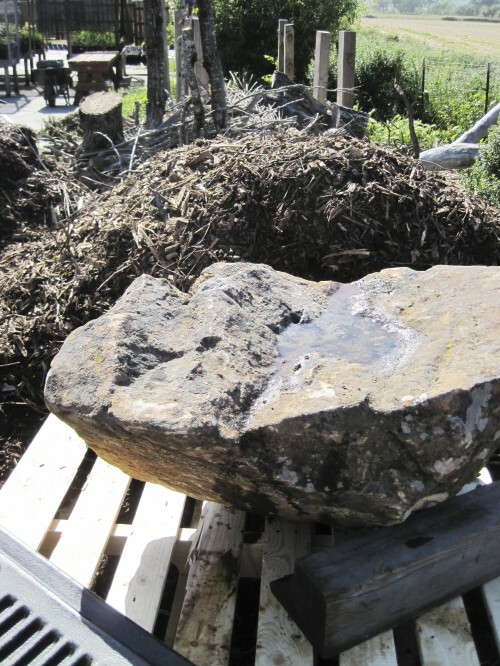 The fieldstone will be used to create habitat installations during the workshop. Hands on! Some of the fieldstone (above photo) has a lot of holes on its surface. 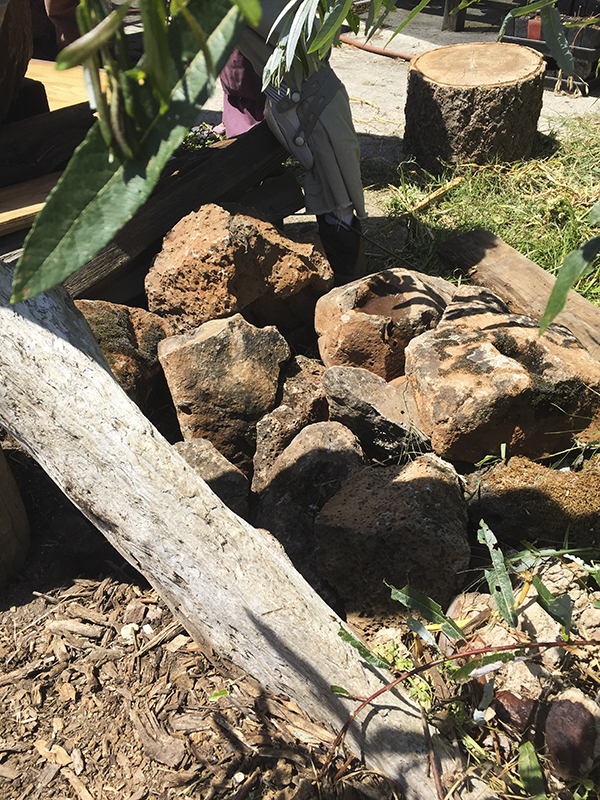 Those stones will be useful in Cricket Corral Splash, Sunday’s habitat installation that will utilize the Laguna Environmental Center’s garden hose drip at the Native Plant Nursery. Every hose must eventually be shut off (very old saying), so when the Nursery’s hose is closed down, the drip will be caught by layers of pourous and water-holding fieldstone. 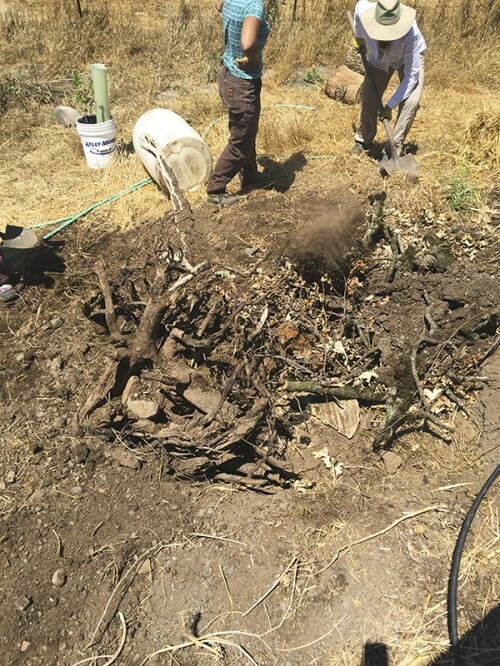 A new Water Park for Cricket Corral Compost‘s critters! Critters will come from far and wide (from the compost and surrounding habitat) for the wet rock, for the moisture, for the pooling drops, for the water! Great place to meet other critters, too; might even find some to eat. It’s habitat! Was a hose shut off and left to drip dry BUT now is also a watering hole for microbes and crawly critters AND a hunting ground for larger animals. A larger fieldstone will be used in the new Shady Oak Seat wildlife habitat installation. The installation will include planting 2 majestic valley oaks (juvenile trees are in 1-gallon pots), creating a subterranean wildlife habitat using a large oak tree stump and other wood hulks, and using a large rock to create a seat under the soon-to-be shady oak, while creating a habitat under the seat. $55 ($45 for Laguna Foundation members). Suitable for 14 years and up (teens must be accompanied by an adult). Pre-registration required. Join us for this informative and fun-filled hands-on workshop with habitat landscaper, Tony McGuigan. 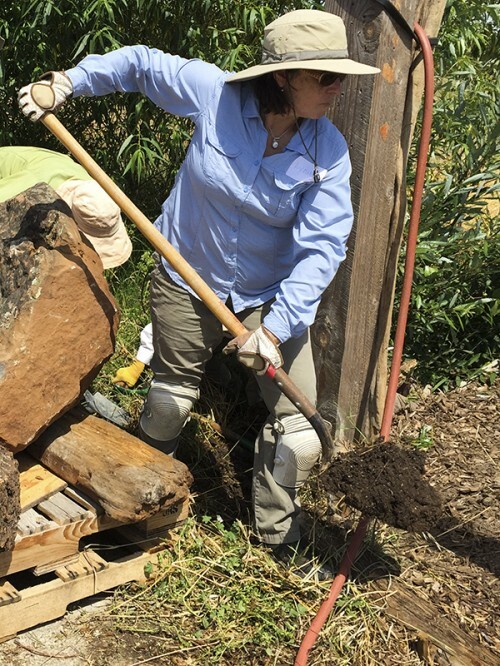 Learn how to “think like a plant,” “think like a critter,” and how to creatively foster wildlife habitat and thriving biodiversity in your own yard. Tony will begin the morning with a presentation inside Heron Hall (without Powerpoint! 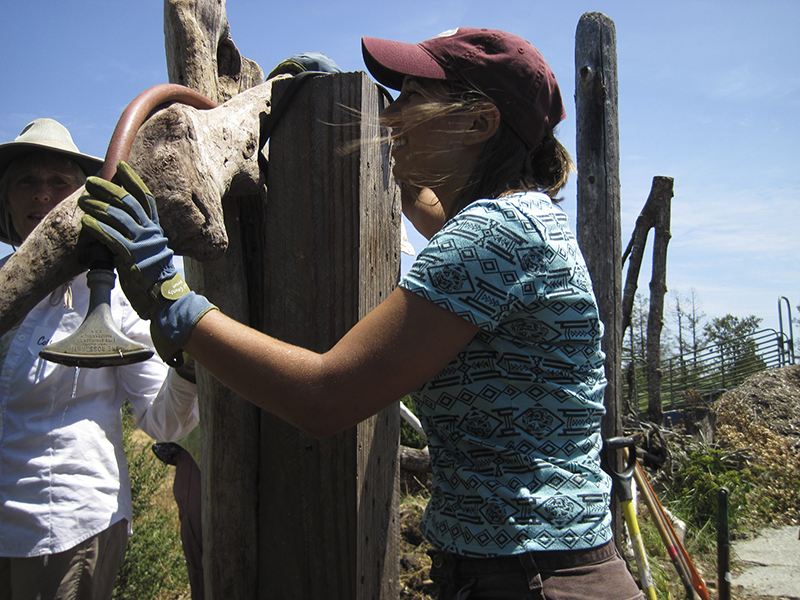 ), then move outdoors for a tour of the habitat projects already installed in the landscape. 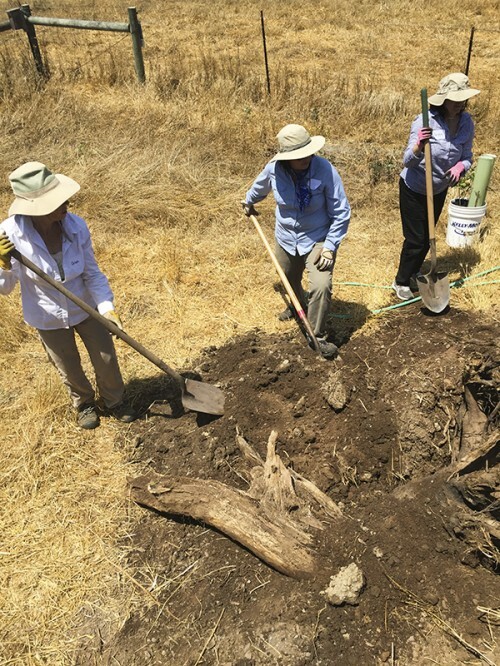 Then we will dig in to create several new wildlife habitats at the Laguna Environmental Center! This workshop will include light to strenuous landscaping work in the sun, although there will be tasks for every ability. 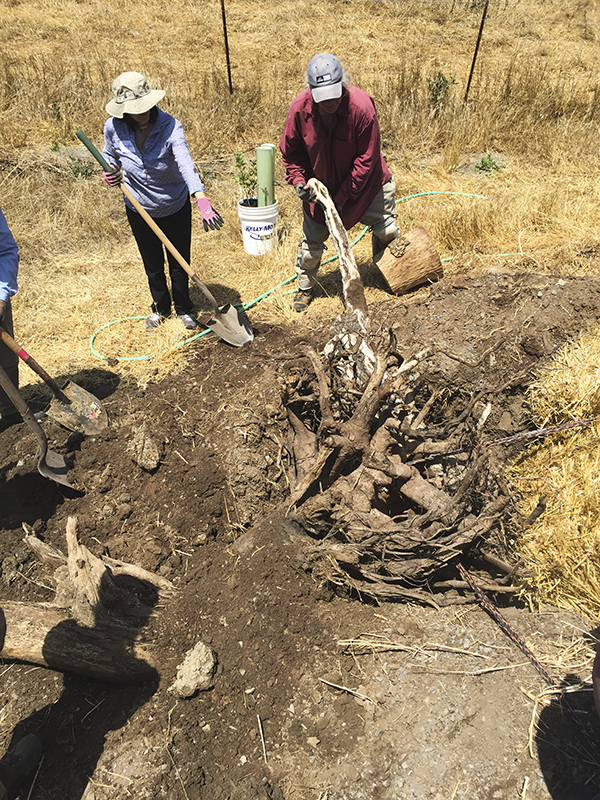 Local materials will be used including native plants, local rock and soil, tree debris, and driftwood. With a strong emphasis on creating natural-looking beauty and aesthetics in the landscape, this workshop will be practical and inspirational. $10 at the door. No RSVP necessary. Join us for this entertaining and informative talk about the why, who, and fun-how of creating animal habitats in residential gardens. Learn about some of the challenges wildlife face in suburbia and solutions to create wildlife-rich neighborhoods. Discover what wildlife might be present in our gardens and practical means to attract those critters. Tony is owner of Spore Lore and the author of Habitat It And They Will Come. His education includes Biology at Long Island University and certificates in Permaculture and Sustainable Landscaping. 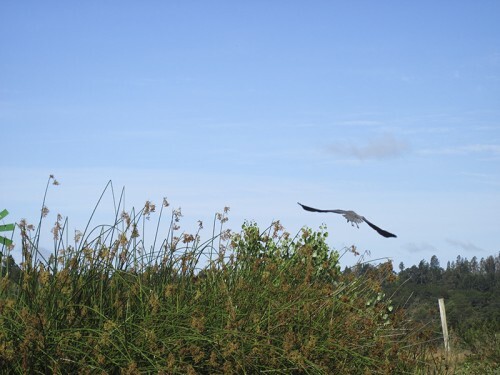 His passions include being a Learning Laguna Docent, a Wildlife Habitat Instructor for Orchard View School’s high school Biology outdoor hands-on class at the Laguna Environmental Center, a habitat landscaper, and doing creative wildlife gardening at home. See you this weekend! Habitat it! 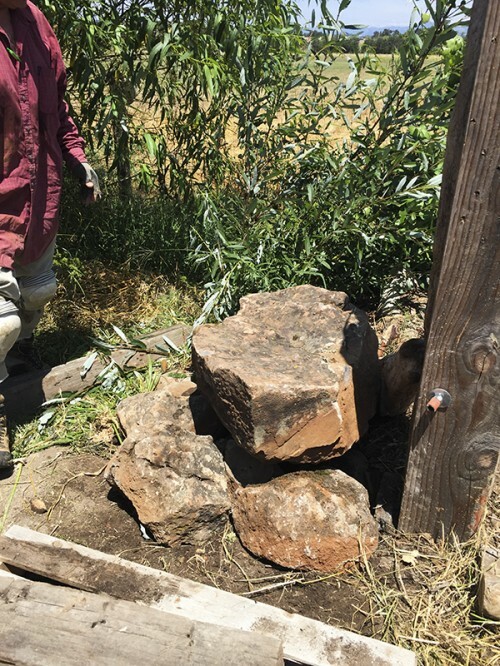 A Sonoma fieldstone landscape boulder on deck for July 12th’s workshop, Creating Residential Wildlife Habitat, at the Laguna Environmental Center. Note the boulder’s ability to hold water — it’s a critter waterhole! 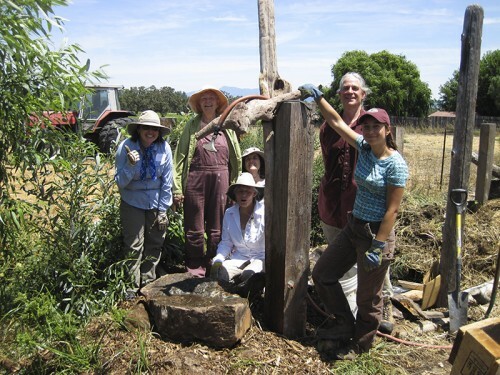 Come hear the why, how, and fun of Tony’s passion for residential wildlife habitat landscaping. Hear how YOU can do such landscaping in YOUR own home gardening. 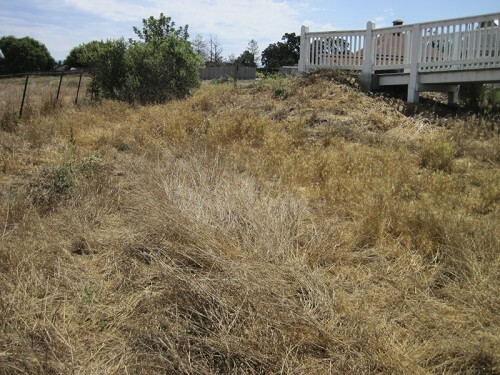 Before and After pictures of the Laguna Environmental Center’s native plant landscape. Presentation will be followed by question session. Snacks. When: Saturday, July 11, 2015, 3:00 – 4:30PM. 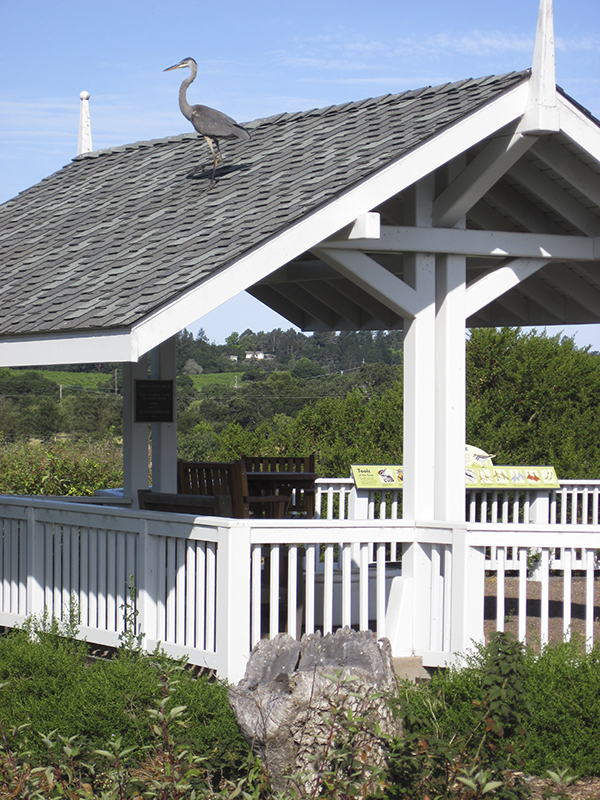 Place: Heron Hall, Laguna Environmental Center, or LEC, on Stone Farm, at 900 Sanford Road, Santa Rosa, California, 95401. The LEC is operated by the Laguna de Santa Rosa Foundation. A red-winged blackbird struts his stuff atop Oak Tunnel Tower, a wildlife habitat installed by Tony McGuigan and the students of Orchard View School at the LEC, January 2014. We will build several wildlife habitats, ranging from simple to more complex. All installation projects will emphasize how such a wildlife habitat installation can be installed in a residential, city, suburban, or country garden. Short talk (no PowerPoint) with snacks, then hands-on landscaping. We will have fun! When: Sunday, July 12, 2015, 10AM. Place: Meet at Heron Hall, Laguna Environmental Center, or LEC, on Stone Farm, at 900 Sanford Road, Santa Rosa, California, 95401. The LEC is operated by the Laguna de Santa Rosa Foundation.